Replaying the Film "Serf" Won't Brainwash Anyone! Translated version orginally published 4/12/2011 at High Peaks Earth: http://www.highpeakspureearth.com/2011/04/replaying-film-serf-wont-brainwash.html. When the CCP propaganda film “Serf” pompously reappeared on Tibetan TV during the “Serf Liberation Day” celebrations, I felt like I was taken back to my childhood during which I had been forcefully brainwashed by the “red devil”. Indeed, I can only use “red devil” to describe this film and its content: for decades, the self-acclaimed “liberators” and “great benefactors” have in fact slowly swallowed up the entire Tibetan region. Deep hatred made me get up and leave; even though for a writer, this would have been an opportunity to study how those in power are rewriting history, but the harm I have experienced over the years made it impossible for me to endure these blatant lies. In 2009, the International Campaign for Tibet published a collection of writings by Tibetan writers titled “Like Gold that Fears No Fire: New Writing from Tibet”. The genres ranged from poems, essays, and diary entries to critical art, and commentaries. The central theme is the protests that swept across Tibet in March 2008, but it also features writings about Tibetans being arrested, sentenced and persecuted. In my contribution to the volume I wrote: "After half a century of mandatory brainwashing and education is not that the monasteries have all been destroyed, but that their memories have been erased or altered. Our duty now is to search for, recover and then amend our memories, and even to re-produce our history and reality." We are deeply worried because looking at the stories about Tibet told by the government discourse and the authoritative system all “introduce” and bend Tibet in a way that it fits with their requirements to then be able to eternally control Tibet. 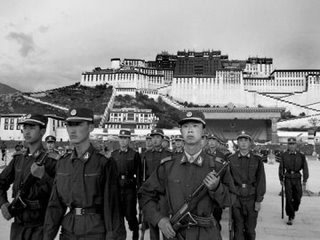 And as for the erasure and transformation of history, the real truth is being covered up, the terror is being concealed, Tibetans have no choice but to remain quiet. The film “Serf”, which represents one method of brainwashing, revered as a “revolutionary classic”, was the first film engaging in the rewriting of Tibetan history. It not only had a clear and imperceptible influence over later Chinese literary and art works dealing with Tibet, it also profoundly distorted the knowledge about Tibet of several generations of Chinese. But in actual fact, the “narrative” of this film is totally inept. For ideological reasons, it demonises and executes a kind of discriminative “portrayal” of Tibet, Tibetan people and especially of Tibetan religion and culture, whose aim it naturally is to gain justification and rationalise imperialistic power. It attempts to tell people in the form of stories that Tibetan people born into a backwards and uncivilised Tibet, were not happy, and had they not been rescued by the "People's Liberation Army" sent by Chairman Mao, there would not have been any way out. However, “Serf” is by no means a real film, it just used cinematic methods to conform to the militant and political imperialist forces and ideologies of the time and also to the multi-faceted imperialist agenda of today. Imperialist ideology is important, it is the spiritual weapon to put colonial-style conquering into practice. The CCP’s definition of Tibetan society is “semi-feudal, semi-serf society”, it calls all Tibetans “serfs”, vilifies them on all levels of society, and it summarises Tibetan environment as extremely poor and barren; all this gives the beautiful “rescue” propaganda every justification and makes it appear totally different from former invaders. What is rather ironic, however, is that those actors playing the serfs who were “liberated”, have today become Tibetan Buddhists, which the film so vehemently attacks. The film “Serf” is in fact just another gun tightly held in the hands of the invaders, only that this gun is already outdated today. As someone who grew up under the influence of “Serf” propaganda, I tweeted that “they are showing the ‘revolutionary film’ ‘Serf’ on Tibetan TV”, and a Twitter friend replied saying: “it is a typical film brainwashing countless stupid pigs, and I also used to be one of them...” Of course, the propaganda by the “red devil” completely fails. No matter how many times they replay “Serf”, it will never explain why in 2008, thousands upon thousands of later generations of the so-called liberated “serfs” took to the streets to raise their voices in protest; it explains even less why not long ago the young monk Phuntsog tried to express his desperate protest by publicly self-immolating. Woeser is a Tibetan poet and author of the book, Notes on Tibet. She frequently blogs about Tibetan politics and culture and her blogs have been banned by the Chinese Government. Woeser lives in Beijing with her husband, Wang Lixiong, a famous Chinese author and critic of the Chinese Government.